After all of the talk about World War Z (now available on Blu-ray/DVD) being troubled and needing re-shoots, it unquestionably proved itself to be one of the surprise success stories of the summer, with over half a billion dollars at the worldwide box office and sparking talk of a sequel. 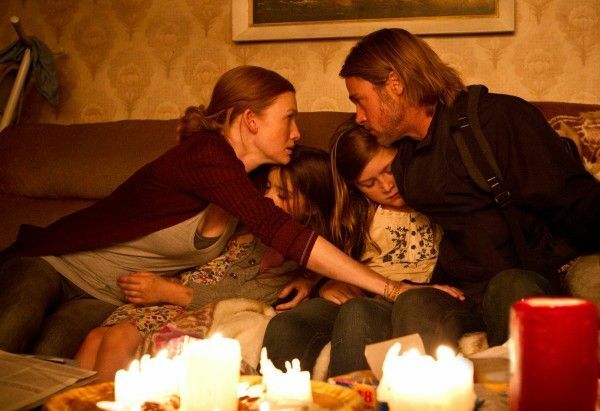 The film follows Gerry Lane (Brad Pitt), as he fights to save and return to his family while a lethal virus spread through a single bite turns healthy humans into something unrecognizable, unthinking and feral. During this recent exclusive phone interview with Collider, actress Mireille Enos (who played Gerry’s wife, Karin) talked about how the film’s success was sweet revenge on everyone who was plotting their doom, that 2/3 of the film is very close to the original script and ultimately only the ending changed, how she’s been approached about the possibility of a sequel, what she thinks will most surprise people about what it took to pull things off behind the scenes, and the most scared she got while shooting. She also talked about her experience working with Arnold Schwarzenegger on David Ayer’s Sabotage, and what she’ll remember most fondly about being a part of the AMC drama series The Killing, which was just canceled after its third season. Check out what she had to say after the jump. Collider: With as long as it took for this film to come out, and all the rumors about it being troubled and re-shoots and different endings and actors getting cut, it ended up being a great film that was a pretty exhilarating ride. Does it feel validating that it opened to such good reviews and box office numbers, even after all that talk about it, ahead of time? MIREILLE ENOS: Yes, it was awesome! It was sweet revenge on all the people out there who were plotting our doom. It is not uncommon for movies to have rewrites and re-shoots. For whatever reason, this just became a pet movie for people to just be petty about. So, when it came out and it was just this awesome monster of a movie, it was exciting, especially because we all just loved it so much. We wanted it to be an awesome action movie, but we also wanted it to be more than that. It was intelligent with this family at the center, and those are the reasons why it was successful. We all feel very proud of it. Was the finished product ultimately anything like the script that you read? ENOS: Yes. The first 2/3 of it are very close to the original script. With the last act, the ending is a new ending. It’s not what the original intention was, but it’s much truer to the heart of the story, and it sets up the potential for a sequel really beautifully. It’s better than our original. Have you heard talk already of a sequel, and is that something that you’d be open to, if another equally good script came about? ENOS: Definitely! Right now, I don’t know how deep the conversations are going. I’ve definitely been approached to say, “This is a real conversation that is happening,” and I’d be thrilled. This is the largest film that you’d worked on, but it would also be the largest film that just about any actor could work on. When you think back about the experience of making it, what are the memories that stand out the most for you? ENOS: Well, all the time with the kids was so sweet. They’re so adorable, those three kids, and they were so excited to be a part of it. It was all larger than life for them, so I experienced it vicariously through these little people, which was the perfect focus for lifting that family and making that family be something you were rooting for. I was really rooting for these kids’ experience to be as great as it could be. Since there are some behind the scenes features on this disc that show what went into the creation of this whole crazy world, what do you think would most surprise people about what it took to pull off this movie? ENOS: I don’t know if anybody gets surprised anymore. There are so many huge movies that are being made. But what I was really surprised by, in the making of it, was that there definitely is some CGI, absolutely, with the wall in Israel and all of that, but a lot of the effects that the audience saw were actual movement artists. They tried their best to keep the digital effects down and to make the marriage between the digital and the real effects be as seamless as possible. So, I think that will be surprising to people. This is a “zombie” movie, but you really can replace that word with any illness or plague. 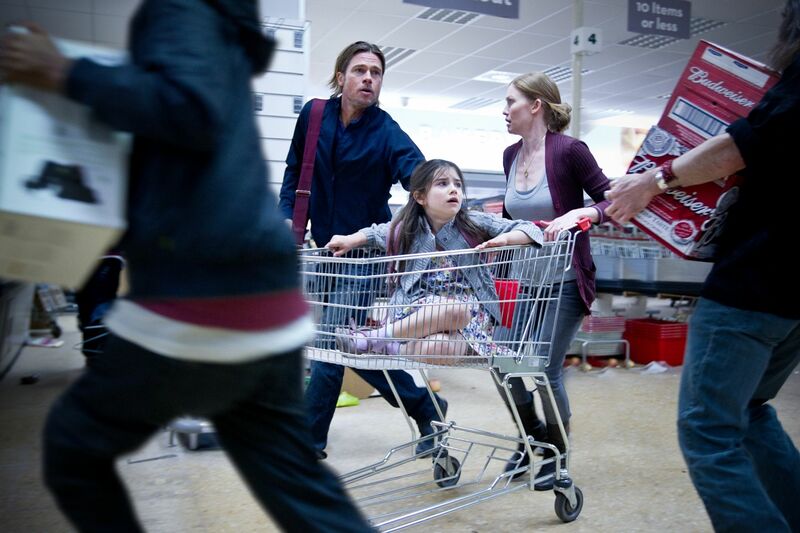 Did you really ever think of this as a zombie movie when you were working on it? ENOS: No. I think zombies are the great analogy right now, for all of our fears about all of the scary things that happen on our planet, and the potential for scariness on our planet. When we were running up the stairs, being chased by three dudes in make-up, that was a zombie movie. But, being chased by anyone or anything can be scary. It was just a big, fun analogy. Obviously, you’re making a movie, but at the same time, it seems like it would be pretty easy to get creeped out on set. Did that happen to you, at all? ENOS: Oh, definitely! When the cameras were rolling, absolutely! When the cameras weren’t rolling, they were adorable people talking in their wonderful British accents and their googly eye make-up. When the helicopter takes off and the zombies are throwing themselves off the roof, and snapping and trying to bite the helicopter, there were real stuntmen actually throwing themselves off. Obviously, it wasn’t a super-tall building. It was a set, but it was a couple of stories tall, and they were actually jumping and throwing themselves off the building while we were in a helicopter on a crane. It was so scary, seeing those bodies lunging at that helicopter. It was awful. Did surviving the zombie apocalypse help prepare you for the experience of taking on an action icon like Arnold Schwarzenegger for Sabotage? ENOS: Nah, he’s a kitten. He’s not scary. I didn’t find him intimidating. He’s just wonderful. He’s a total team player. He’s sweet and intelligent and self-deprecating. It was great. For whatever reason, I often find myself in a cast of a lot of men. It’s something that I feel comfortable with and enjoy. I was surrounded by all of those awesome guys – Sam Worthington, Joe Manganiello and Max Martini. It was these wonderful, big, huge guys and me, and I had a great time. David Ayer is a director who’s into really gritty, grounded action. Do you enjoy that kind of grounded physical work? ENOS: I do. I love that kind of work, especially when it’s intelligent. What I think is so interesting about David is that he loves that gritty world, but not simply because of the grit. He’s actually a character director and he’s fascinated by the type of people who aren’t action stars. That’s their actual life. There are people who spend their lives working in these kinds of worlds, who are SWAT team leaders, going into these cartel houses. He’s fascinated by what happens to people’s lives when they spend their time in that kind of darkness. The cops in End of Watch just walk into hell every day, and what happens to them? And that’s super interesting to me. It’s this action world, but it’s grounded in the reality of people’s lives and hearts and personalities. It’s really exciting storytelling for me. 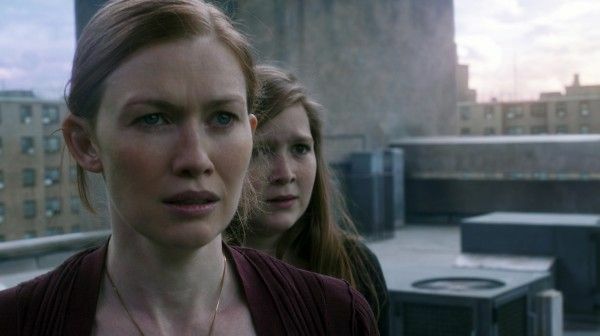 You did truly phenomenal work on Season 3 of The Killing, and the show got a lot of praise for the performances this season. What do you think you’ll remember most fondly about your experience on the show, and how do you feel this last season fit into things for you? ENOS: Well, I’m so proud of this third season. I’m so grateful that we got to do it. It was so tied into Sarah’s mythology and the mystery of what had happened. It would have been really sad to not get to tell that story. I think [show creator] Veena Sud is just a wonderful storyteller. I adored my work with Joel Kinnaman. He’s one of my favorite people that I’ve ever gotten to work with. I have just such high regard for him. And then, there was the rest of the cast this year, getting Peter Sarsgaard on the show, who is remarkable, and Elias Koteas. I think what I’ll take from the third season is getting to play ball at a really high level with incredibly talented actors. The level of work this season was so high. And what’s always been true about the show is that we had this incredible crew. It had become a family. It felt so safe and supportive. And when you’re doing really dark material, it helps to have that kind of safety. It was just such a pleasure to be a part of it. 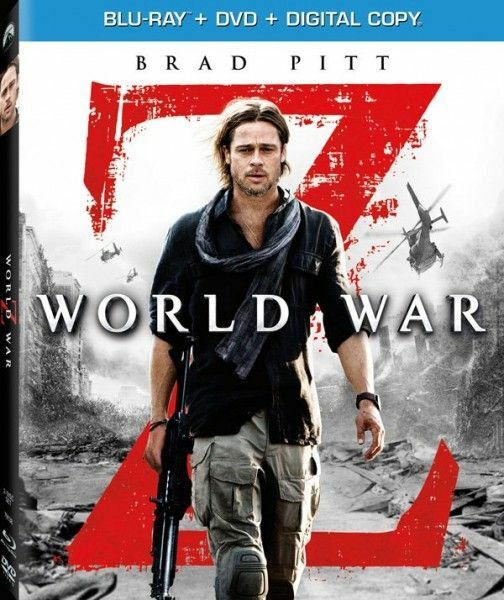 World War Z is available on Blu-ray/DVD on September 17th.